Gravity Simulator - Kirkwood gaps? Has anyone tried to use GravSim to simulate/recreate the Kirkwood Gaps in the asteroid belt? I guess it'd have to be done with a lot less asteroids (say 100-1000?) but it could be interesting to see how a load of objects randomly scattered between Mars and Jupiter evolve over time... would you get something similar to the real asteroid belt here (with Kirkwood gaps and the 3:2 asteroids)? GS can handle resonances, right? More interestingly, would you get the same features in belts in others planetary systems with different planets and orbital parameters? I don't know how computationally painful it'd be to try to simulate it, but it could be interesting to try. I think GS can handle this . Maybe Tony has done it already ? Maybe it will take a lot of time before this gaps really appear ( they won't appear visually , but one has to look for the SMA of each object ) . Nice sim to let work at night . Edit : this sim may take a lot of time , if one considers the orbital period of Jupiter is 10 years and if it takes lets say 100 revolutions to get some resonace pattern one gets 1000 years of simulation at least . Actually the best way to see them is to plot the inclination or eccentricity vs the semimajor axis (on the x-axis). They're really obvious shown like that. Incidentally, if anyone knows of a spreadsheet program that can show more than 32,000 rows of data can you point me to it? I've got the orbital data for over 100,000 asteroids but Excel refuses to plot more than the first 32k of them (it's enough to show the structure, but not ALL of them). And here's the inclination vs the SMA - you can really see the asteroid families here too. (the clump at 5.2 AU in both graphs are the Trojans in Jupiter's orbit). I'll discuss it more later on when I have the time. In which format do you have the data ? It's possible to write some code to represent them in various ways . I've done some partial Kirkwood gap simulations. I'll dig it up for you later. But I'll briefly describe it now. I computed the semi-major axis of one of the resonant zones. Let's just say for example that it is 3 AU (I'll look up the exact answer later). I placed 100 objects evenly spaced from 2.9 to 3.1 AU, every 0.1 AU. I ran it for a few million years. When I was finished, all the objects between 2.99 and 3.01 were ejected, and the others were virtually undisturbed. This confirmed that Jupiter will clear the gap at that resonance. You can probably plot all the points you want in IDL. Additionally, I've made my own graph creator in Visual Basic. It doesn't have many features, but if you can give me the semi-major axes in text format, I can plot all of them for you. One issue that might be a problem, is that the graph might be too crowded with over 100,000 points. Even the gaps might appear full because of screen resolution. Nice to have a graph generator . I've just finished a gsim with 600 bodies from 3AU+/- 40% . Result output every 10 years . Can you make a graph out of this ? ( a, e are saved in the file ) . Size: <2MB . First, a disclaimer: The Kirkwood Gaps are not visible gaps like the Cassini Division in Saturn's rings. There are pleanty of asteroids in the Kirkwood Gaps. However, most of them are asteroids with semi-major axes that do not equal the gap distance, but with enough eccentricity that they can cross the gaps. There are very few of them that possess semi-major axes equal to those of certain resonances. So the Kirkwood Gaps are only gaps in a histogram of semi-major axes like the image Mal posted. Asteroids in Jupiter's 3:1 interior resonance go around the sun three times for every time one time Jupiter goes around the sun. So their periods should be 1/3 Jupiter's period. Jupiter's orbital period is 4331.572 days. So their orbital periods should be 4331.572 /3 = 1443.85733333333 days. Using the formula , and converting everything into proper units (just use the calculator here: http://orbitsimulator.com/gravity/articles/formula55.html , enter 1443.85733333333 for P, choose "d" for units, enter 1 for mass and choose "solar masses" for unit, and choose AU for output units), asteroids in Jupiter's 3:1 interior resonance should have semi-major axes of 2.50 AU. The objects are color-coded and are given names that reflect their initial semi-major axis. For example, "2p47 28" has an initial semi-major axis of 2.47, and it is the 28th asteroid in the simulation. Let the simulation run at a time step of 16384 seconds, and in 3 million years, you'll find that most of the objects that started at semi-major axes of 2.50 and 2.51 (2p50 nn & 2p51 nn) are no longer in circular orbits, and many have very high inclinations. All other asteroids are virtually unchanged. If you don't want to wait the simulated 3 million years, the simulation http://orbitsimulator.com/gravity/simulations/j3_1_3millionYears.gsim shows this system 3 million years later. This simulation begins in "ecliptic view" so you can see the high inclinations. Drag the scroll bar to the top to return to a top-down view. Here's some screen shots of the above simulations. This is after 3 million years, looking top-down on the ecliptic plane. The blue objects were originally in orbits with semi-major axes of 2.50 AU, and the purple ones, 2.51. Four of them have been ejected out of the solar system. Eight of them are still in circular orbits (ecc < 0.1). Some of these have had their semi-major axes perturbed out of the 3:1 resonance, so they are protected for now. This is a view from within the ecliptic plane, showing the very high eccentricities of some of these asteroids. The following animation is the result of a gsim simulation . 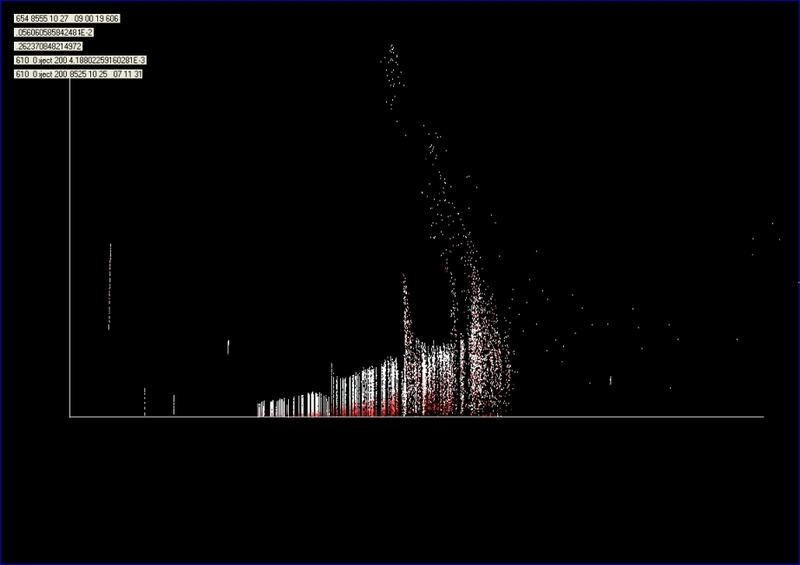 600 bodies were created at 3AU+/- 40% , so simulating an asteroid belt ( 0 incl , 0 eccentricity) . The a and e of each body were saved in an output file , every 10 years . The sim was run for 8500 years at 16000 seconds. I wrote a small programm able to read the Gsim-output file and able to represent the a and e value of ech body . ( a is represented from left to right , e is represented bottom up ) . So each dot represnts a body . One can see the bodies originally at e=0 . The eccentricity of each body increases with time . The 4 little dots at the left are Mercury ,...Mars . The stationary dot at the right represents Jupiter . One can see also some gaps are created ( fi 2 cm to the right of Mars ) . . The screenshot which doesn't erase every previous picture shows the gaps more clearly than this animation . I'll try to post it also . Perhaps this is a better representation : The following picture represents the final distribution of a,e of the simulated bodies . As the color of the bodies was changed from red at start to white at the end of the simulation one can see some gaps are created ar certain distances . The four lines at the left are the inner planets, where Jupiter is the line at the right . Furthermore the eccentricity of each body seems to change largely with time . Edit : is it due to my vision that I'm seeing a kind of bow starting at the right end of the belt and going upwards to the left ? Can this mean that a decreasing sma goes together with an increasing e ? Cool, those are really interesting sims and graphs. (I'd play more with this myself but I don't have the time right now... but thanks for trying these things out!). It's interesting how you can watch the eccentricities increase over time in the animation that frankuitaalst did. What might be interesting is to see if including Saturn in the system makes any difference - I think there are some secular resonances (the nu 6 one?) that can affect the inclination - these are mentioned on page 315 of Solar System Dynamics. I stripped out the asteroid number, semimajor axis, eccentricity and inclination and used those to make the graphs. Note that the data contains asteroids outside the main belt, so if you're showing them on a graph and want to focus on the belt you have to trim the range of the graph axes. I'll attach the data in the next posts.